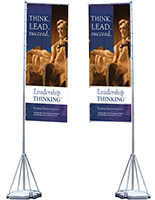 These Flags and Banners are Silkscreen Images for Exceptional Outdoor Promotional Exhibits! Business Signs in Feather Styles are Sold Online as Well! 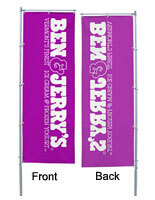 Order the Right Flags and Banners to Garner More Exposure! 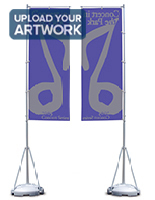 These promotional flags and banners are total packages that include TriPole flagpoles and single-color custom graphics of your choice. The advertising signs measure 13ft. 1in. 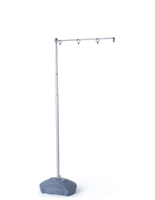 in height, making them ideal for implementation at carnivals, street dances, fairs, tradeshow events and more. These flags and banners, also called feather sign flagpoles, were developed for use with the provided 31-1/2"w by 94-1/2"h pennants. Because they are so tall, these outdoor fixtures are a great way to showcase sponsorship, publicize goods or promote brand recognition. Flags and banners are designed to weather exterior conditions; however, they make very practical interior signage displays also. An added bonus of these promotional sign systems is that one person can easily put it up in only a matter of minutes. 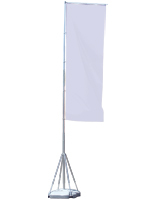 These flags and banners come equipped with telescoping action, so the aluminum flagpoles are collapsible for convenient storage. 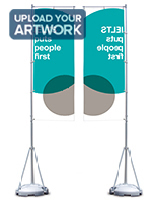 Graphics can be affixed to the flagpoles while on the ground. Then each section of the pole is hoisted up and secured. 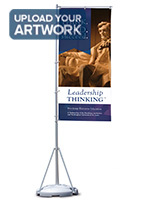 The horizontal flag arm ensures signage is easily read by viewers. 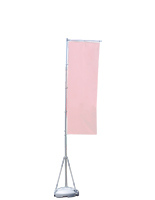 This flag arm frame also pivots with the wind to handle the load and simultaneously creates eye-catching motion. At the bottom of each of the flagpoles, there is a three leg support mounted on a plastic base. This polymer base is usually filled with either sand or water to supply stability. The base also fits into an included travel bag while not in use. 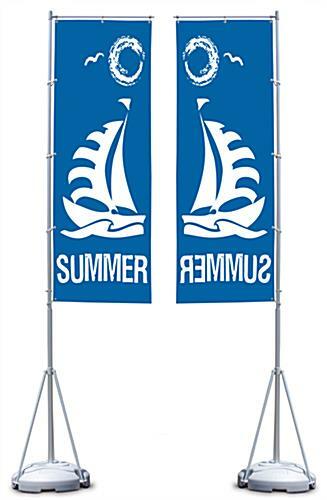 These flags and banners for outdoor use are one-color signs rendered from your works of art. The graphics are rendered onto a durable knitted polyester fabric using a silk-screening procedure. Though the images are printed to just one side, the heat-transferred imagery permeates through the fabric for a reverse emblem on the back surface. Because these pennants are printed with a silk-screen process, a 10-unit minimum order is required. When transporting the displays to and from events, use the enclosed carrying case for easy maneuvering. 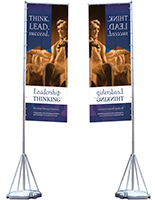 We are proud to offer signs for these TriPole flags and banners. We have researched many different options and have come up with a solution that we feel is best and most reasonably priced. These are real flags that will blow in the wind, not heavy vinyl banners. Although they are not the most inexpensive pennants you may find, with proper care and use they will last for years without fraying while maintaining their brilliant colors.